Look at this sweet Snow Bunny Hanna! Oh my gosh, I love her! Every image in the set is TOO CUTE!! The Hanna releases just get better and better...... and wait till you see the new Riley/Sophie stamps! 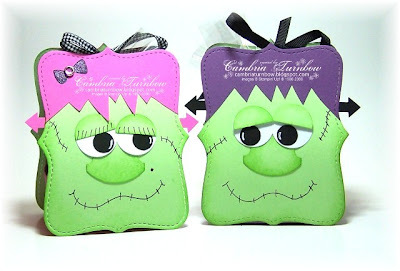 I'm drawing a winner tonight by the way, so don't forget to enter for a chance to win the Hanna blog candy! (see previous post). 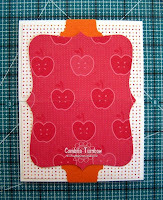 Paper: Neenah White, Chocolate Chip, Pink Passion, Georgia Peach Designer Paper (SU!). Other: Pixie Pink Fun Flock, Pastel Raspberry Liquid Pearls, Glossy Accents, Quickie Glue Pen, Scallop Edge Punch, Scallop Square Punch, Nesties, Cuttlebug, Dimensionals, Chocolate Chip Poly-Twill Ribbon, Janome Sew Mini, Angel Wings Shimmerz, Paint Brush, Holiday Snow Dots Embossing Folder, Scor-Pal. 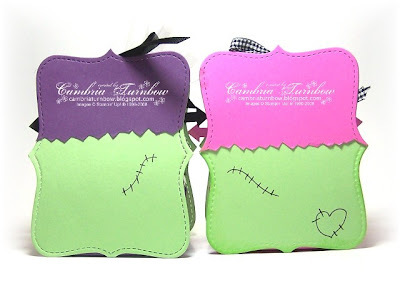 Don't forget to add your name to the blog candy post... it's the last day!! And, thanks for all the sweet comments.... you make my days! Have a great day.... thanks for stopping by! What's better than chocolate mousse? New Riley stamps of course!!!! 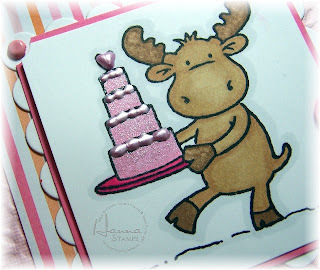 In celebration of Hanna Stamps first year in business, Kristi has lots of giveaways for you!!!!! Visit our Design Team Blogs between now and Wednesday, October 1st to see exciting sneak peeks and for the chance to win a never seen before Riley/Sophie Moose Image. Leaving a comment on each blog, will increase your chances of winning. 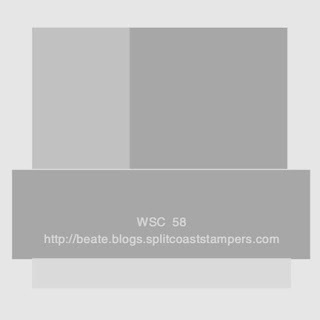 One new stamp per Design Team member blog will be given out. 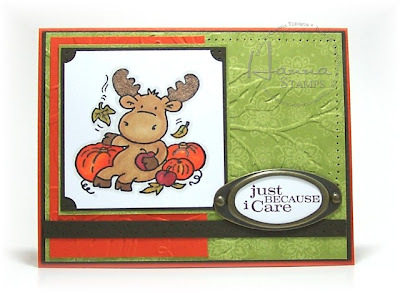 Winners will be announced at the Hanna Stamps Release Party on Thursday October 2nd at 9:00 p.m. So pop into the party for challenges, prizes, chatter, more prizes and to see what the Design Team has in store for you. Check out the other design team members!!! Hello Friday!! Wow, it's been a crazy busy week. 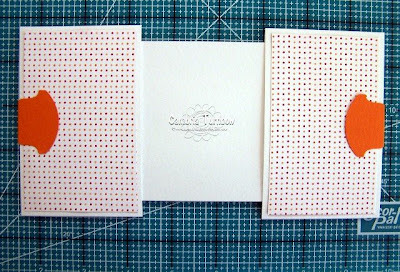 I'm looking forward to tomorrow because it's stampin' day with my girls! Today is Beate's Weekend Sketch.... hope you can play along with us . Did this week go by super fast for you too? Wow, where did September go? As always, Beate has a great sketch for us. I used the Sweet Always Designer Paper for the three panels. 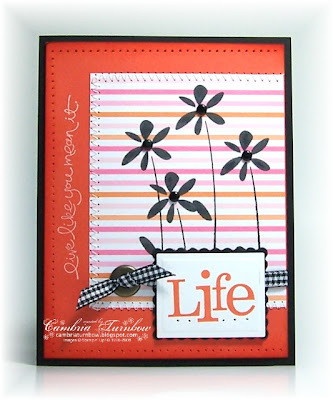 The scallop is made with the Pennant Bigz Die from Stampin'Up! The birds are colored with watercolor pencils and then blended with a blender pen. I liked this sketch so much, I decided to try in on the side too. 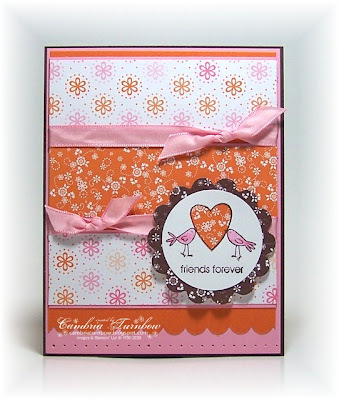 Paper: Chocolate Chip, Pink Pirouette, Only Orange, Sweet Always Designer Paper. Ink: Timber Brown Stazon, Watercolor Pencils. Other: Pink Taffeta Ribbon, 1 3/4 inch Circle Punch, Pennant Die, Big Shot, Crafter's Tool Kit, Scallop Edge Punch, Dimensionals, Watercolor Pencils, Blender Pen, Scor-pal. Hope you all have a wonderful weekend! As always, thanks so much for stopping by! Sorry I haven't posted much this week, but it's been SO busy in the Turnbow house. The Frankie face was inspired by many that I've seen. If it was your original idea, send me a quick note and I'll be happy to give you credit. I didn't CASE anyone specifically. 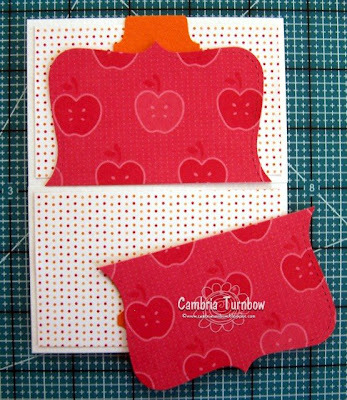 The Frankette idea hit me when I saw the pink cardstock out on my desk. LOL.. there is always pink cardstock on my desk! 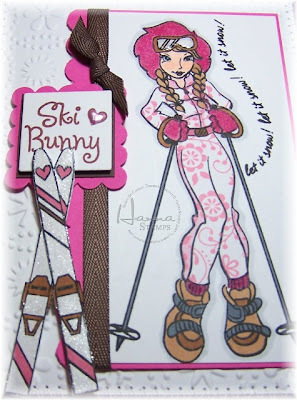 The little bow stamped in her hair is from the Just Jawing stamp set with a Round Rhinestone brad in the center. Frankie's eyelids are raised up with dimensionals. OMGosh.. these were SO easy to make if you have the Big Shot! I'm totally whipping these out for my daughter's classroom this year. Okay... so my heart needs some work, but I did it on a whim. Here is what the back of the treat boxes look like. 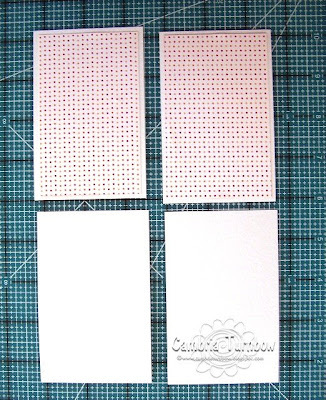 I cut my card stock 6x 11 and scored the 11 inch side at 4.5 and 6.5 with the Scor-Pal. Then I flipped the cardstock so that the six inch side is at the top of my Scor-pal and scored at 1.5 and 4.5. I then slid it into my Fiskers cutter and cut on the score line from the top of the 6 inch side down to the center score line. I did that on each score line for a total of four times. Then, I slid the 11 inch end into my fiskers again and cut off two inches of the flaps we just made. I then used my Scallop Edge punch and centered it along the ends to make the ends pretty.Fold and glue. Instead of glueing the sides like I did with the Baby one, I left these unglued to make it easier to get into the box. 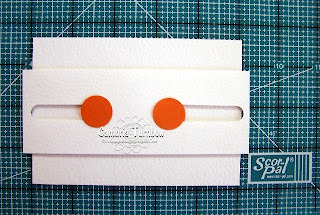 I also closed them differently by using the Slot Punch and ribbon. If you don't like the ribbon showing, you can tuck the bow down inside. 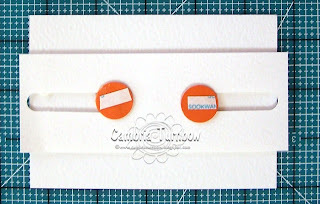 *Make sure when you are adhering your faces on, that you do not add any adhesive around the slot punch so that you can slide the ribbon through. 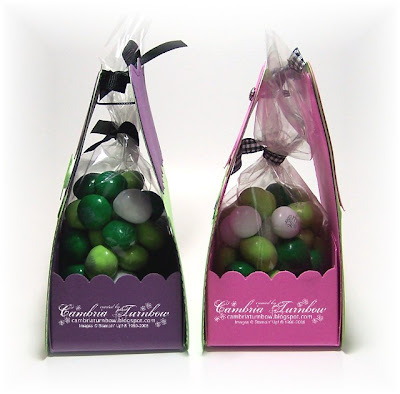 Paper: Green Galore, Pink Passion, Elegant Eggplant, Basic Black, Whisper White. Ink: Green Galore, Black Stampin Write Marker. 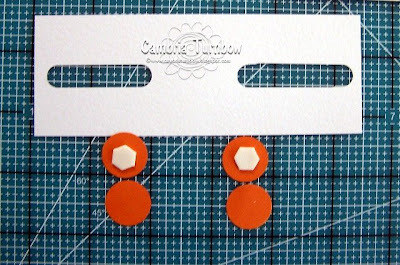 Other: Sponge, Rhinestone Brad, Grograin Black and Gingham Ribbon, Slot Punch, 1 Inch Circle, 1/2 inch circle Punches, Round Tab Punch, Scallop Edge Punch, This Way Punch, White Uniball Gel Pen, Dimensionals, Scor-pal, Big Shot, Top Note Die, Small Cello Bags, Candy. 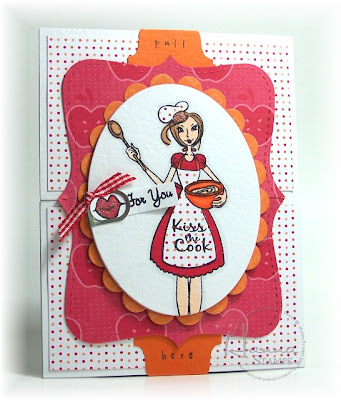 Thanks for stopping by... see ya tomorrow for Beate's Weekend Sketch Challenge! Wowza! Would you like to win a chance at winning over $1,000.00 in prizes, donated by all THE best stamping/crafting companies? 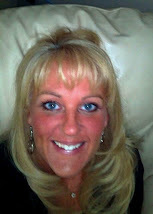 You DO NOT want to miss my friend Carolyn's blog candy!! And, better yet, it's for a GREAT cause! Please go over and check it out... what an amazing, generous bunch of woman. You are DA BOMB miss Cammie!! I changed it a bit. 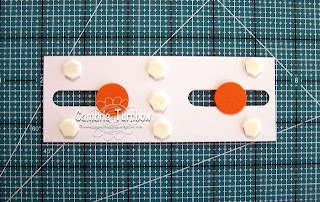 You can see a tutorial written by Jody Morrow here. (Thanks Jody!) 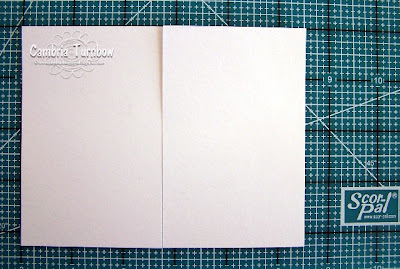 I cut my card stock 6x 11 and scored the 11 inch side at 4.5 and 6.5 with the Scor-Pal. Then I flipped the cardstock so that the six inch side is at the top of my Scor-pal and scored at 1.5 and 4.5. I then slid it into my Friskers cutter and cut on the score line from the top of the 6 inch side down to the center score line. I did that on each score line for a total of four times. Then, I slid the 11 inch end into my friskers again and cut off two inches of the flaps we just made. I then used my Scallop Edge punch and centered it along the ends to make the ends pretty.Fold and glue. I made the slots at the top of the box with my Word Window punch and then added a Kaiser Rhinestone to one of the clippies in the Stampin'Up! Clip assortment pack and clipped it closed. 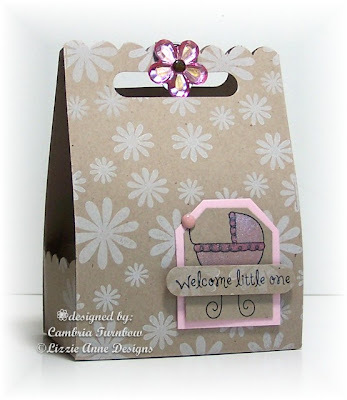 I used the Flower Power and Baby Carriage stamp singles from Lizzie Anne Designs. This came together super easy and fast. I added some shazam to the carriage with Bubble Gum and Magenta Shimmerz Paint. 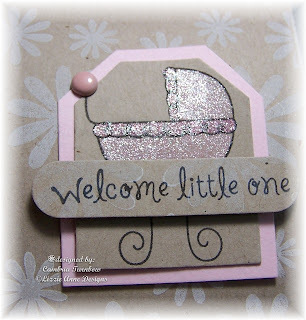 Stamps: Flower Power and Baby Carriage (Lizzie Anne Designs. Ink: Whisper White Craft, Ranger Distress Soot Black. Other: Dimensionals, Tag Punch, Word Window Punch, Scallop Edge Punch, Clip Assortment, Heidi Grace Pink and Brown Brads, Kaiser Rhinestones, Scor-pal, Crafter's Tool Kit. Hope you all have a great weekend. I had three out of four kids home yesterday feeling really bad. Today is a better..... I just hope I can skip this bug!!! Thanks for stopping by! Happy Friday everyone! Wow, this week went by FAST. Way too fast and my weekend doesn't look like it will be any less busy. To top it off, I've got two very sick kids. Sheldon came home early yesterday from school and Jayce was up throughout the night just miserable. Looks like I'll be making a trip to the Dr.'s office this afternoon. 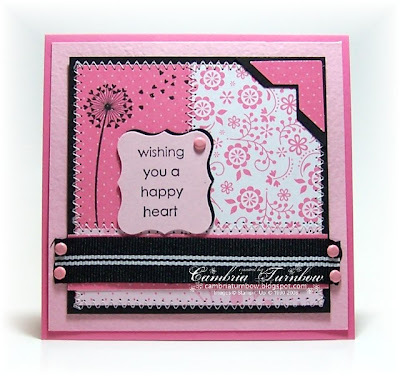 Paper: Sweet Always Designer Paper, Regal Rose, Basic Black, Textured Pink Pirouette. Ink: Basic Black Craft, Basic Black. Other: Curly Label Punch, Photo Corner Punch, Crafter's Tool Kit, Jersey Shore Ribbon Originals, Soft Subtle Brads, Janome Sew Mini, Scor-pal, atyou Spica Black Glitter pen. Hope you have a wonderful weekend... thanks for stopping by! The Holiday Mini Catalog will be available October 1st! It's only a few weeks away! Dang... where did September go? Here's a sneak peek of one of my favorite sets from the mini. It's called Love Owl-ways. Look at that sweet little birdie!! I told you that I was a sucker for all things hearts. The little mailbox flag is cut out and raised up with a dimensional. I stamped another mailbox, colored the flag, cut it out, then stuck it over the one on the image. Paper: Ballet Blue, Whisper White, Georgia Peach Designer Paper, Barely Banana. Ink: Distress Soot Black, Copics, Basic Brown. Other: Nesties, Cuttlebug, Dimensionals, Bubble Gum Shimmerz, Fairy Tale Ribbon Originals, Filigree Brads, Crafter's Tool Kit, Barely Banana Brad, Stamp-a-ma-jig, Scor-tape. Hope you all had a great week so far... I'll see you tomorrow for Beate's Weekend Sketch. 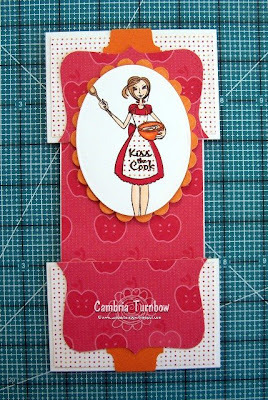 One more card made with the set L'Amour. Don't you just love the sweet face on this bird? I love the heart swirly background and the hearts on her tail too. 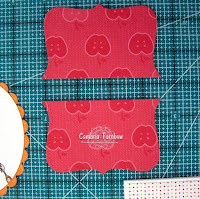 The heart tucked under her wing and the one on the ground are actually the wings from the butterfly in the set stamped onto the Chatterbox designer paper, then cut out. I took a craft knife and made a little slit above her wing to tuck one in. The bird is colored with Copic Marker Y21. I added the light spots with the Copic Blending Pen. The sentiment is raised up on Dimensionals. I also added Beeswax Shimmerz Paint to the hearts on her tail and the flowers on the hearts. 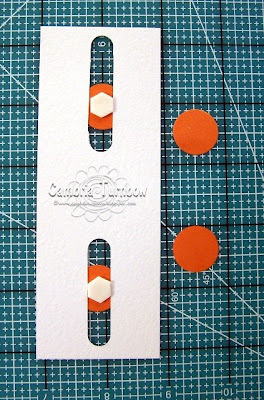 Paper: Prism, Neenah White, Chatterbox Designer Paper (Tangerine Beach Blossoms). Ink: Ranger Distress Soot Black, Copic Markers, Versamark. Other: Shimmerz Beeswax, Nesties, Cuttlebug, Taffeta Ribbon, Word Window Punch, Dimensionals, Scor-pal. Today was the first day with the new bus schedule. The kids had to be ready to catch the bus at 7:17. We live less than five minutes from the school..... it's CRAZY. I could see them being on the bus that long if we lived out of town. I predict, there will be a lot of "missed the bus" days. Have a great Monday everyone! Thanks for stopping by! Okay, so my friend Pine has me on a Kraft cardstock kick. I got it out because I ordered her new stamp set and HAD to use Kraft with it, now I can't put it away. 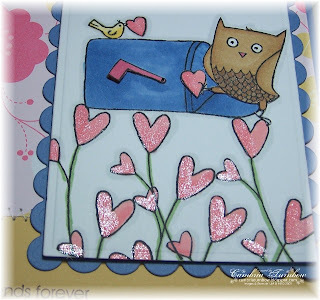 This stamp set is from Lizzie Anne Designs... one of my very favorite stamp companies. :) It's called L'Amour. Those girls are SO awesome at putting together great sets. 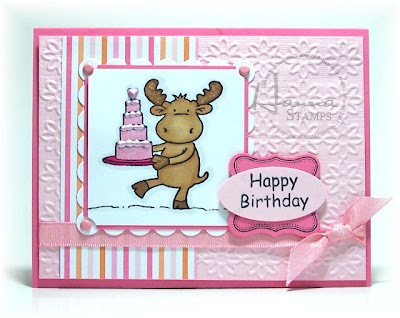 They always have a nice variety of stamps and sentiments so that your creativity has no limits. I think besides floral sets, my next weakness is sets with hearts. LOVE that butterfly with the heart wings. September is a really difficult month for me and my family. So, even though I look forward to fall and the kids going to school and the crisp fresh air, there is also a sickness in the pit of my stomach that brings back really difficult memories. I lost my sister in a car accident... she was killed on the 7th and her birthday was the 10th. It's been 18 years now, and although the pain isn't an every day feeling anymore, it always seems to come back with a vengeance in September when I can really feel the hole in my heart and the big void space that she left in my life. I have very dear friend, who also suffered a huge loss this week last year. Her pain is still very fresh. My heart breaks for her. I know what a struggle it is to seem normal to others when you feel like you are broken to pieces inside. I'm sending her this card with a hug just to let her know that I am thinking of her and I love her and I wish I could take away some of her pain. Paper: Kraft, Barely Banana, Whisper White, It's a Party (Heidi Grace). Ink: Memento Tuxedo Black, Craft Whisper White. Other: Nesties, Cuttlebug, Dimensionals, Banana Brads, Fairy Tale Ribbon Originals (SU! ), Crafter's Tool Kit, Janome Sew Mini, Scor-pal. Hope you all had a wonderful weekend...boy they go by fast. See you tomorrow. Happy Saturday! I've got one more Hanna Sketch Challenge today. You can check out my previous post to see the sketch by Shannon. We'd love for you to play along with us! I colored Riley with Copic markers and decorated the birthday cake with Shimmerz Bubble Gum paint. I then added "frosting" with Pastel Raspberry Liquid Pearls. Love this fun sketch! Stamps: Riley Collection (Hanna Stamps) Cute and Curly (SU!). 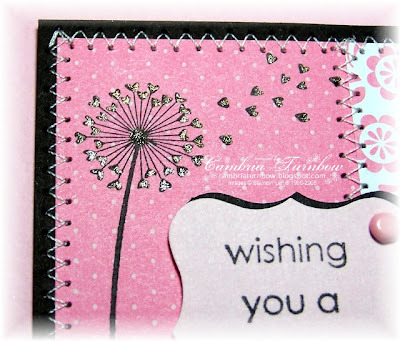 Paper: Textured Pink Pirouette, Regal Rose, Neenah White, Sweet Always Designer Paper. Other: Curly Label Punch, Square Nesties, Cuttlebug, Embossing Folders, Dimensionals, Large Oval Punch, Pink Taffeta Ribbon, Crafter's Tool Kit, Brads, Shimmerz Paint, Liquid Pearls, Scor-pal. Have a great weekend stampers!!! See ya tomorrow. 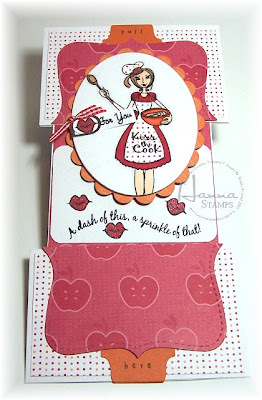 The challenge this week in the Hanna forums is sketch challenge! This weeks challenge brought to us by Shannon Tompkins. Thanks for the fun sketch Shannon! 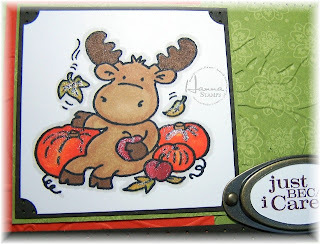 I chose this cute Riley Moose with the pumpkins and apples for my main image. He's got Fun Flocked antlers and the leaves, pumkins and the apples have just a little bit of shimmer. This time instead of painting the complete image with Shimmerz Paint, I just added a bit to the pumpkins, leaves and apples. I used the new colors Beeswax, Rustic Red, and a little bit of Pumpkin Shimmerz Paint. 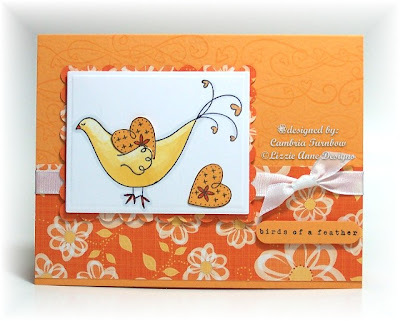 I embossed the background designer paper with leaves and the orange cardstock is embossed with pumkins from the new Cuttlebug Folders. 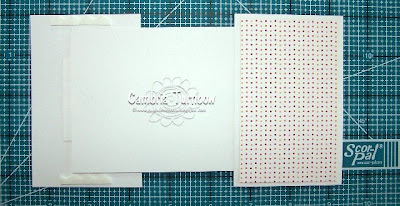 Paper: Prism, Neenah White, Bali Breeze Designer Paper (Stampin'Up!). Ink: Ranger Distress Soot Black, Copic Markers, Basic Brown. Other: Crafer's Tool Kit, Shimmerz Paint, Fun Flock, Quickie Glue Pen, Antique Brass Hodgepodge Kit, Large Oval Punch, Pumpkin and Leaves Embossing Folder, Cuttlebug, Ticket Corner Punch, Dimensionals, Scor-Pal. Hey everyone.... TGIF baby! I don't know about you, but it was a hard week! I'm happy to see Friday and I'm looking forward to the weekend. 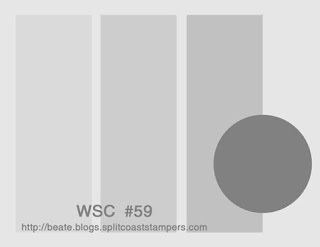 Friday means it's Beate's Weekend Sketch Challenge! Hope you can play along with us! 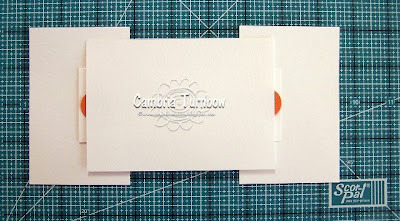 Paper: Sweet Always Designer Paper, Basic Black, Whisper White, Tangerine Tango. Ink: Tangerine Tango, Whisper White Craft, Basic Black Craft. Other: Crafter's Tool Kit, Nesties, Cuttlebug, Black Gingham, Large Eyelets, Vintage Brads, Janome Sew Mini, Scor-pal, Dimensionals, sponge. Have a great weekend!! Thanks for visiting! Of course I had to also get out my Kraft cardstock. Pinie is the queen of kraft.... I love all that she touches! Stamps: Rustic Branches (Pinefeather Press) Available at Papertrey Ink. Ink: Ranger Distress Soot Black, Craft Whisper White. 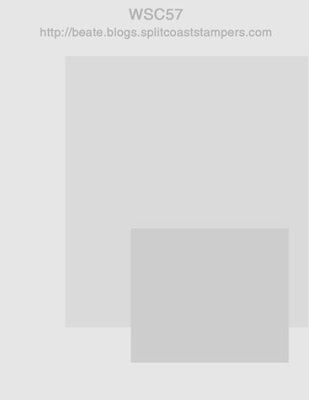 Paper: Kraft, Whisper White, Basic Black. Other: Shimmerz Celery Paint, Small Paint Brush, Polka Dotted Ribbon (starlitstudio), Dimensionals, Cuttlebug Embossing Borders, Nesties, Janome Sew Mini, Scor-pal. 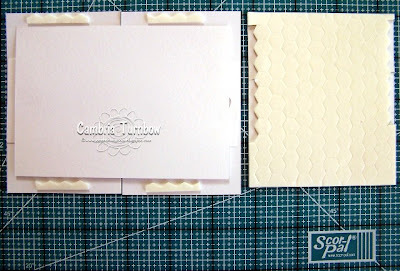 I painted a piece of Kraft cardstock with a wide paint brush using the Celery Shimmerz Paint, let it dry, then ran it through my Cuttlebug with one of the new embossing borders. I also added paint to all the leaves. I love how the Shimmerz brings the Shazam factor to this card. It's just the right touch of shimmer.